As animation software becomes more advanced and graphics become more refined, the opportunity to create informative detail becomes more achievable in your characters. You can't give every character the same facial contours anymore. Today's graphic engines and hi-definition screens enhance detail, and the features in your character can make or break the believability of your game or movie. Face It provides you with the resources that you need to ensure an accurate character model. 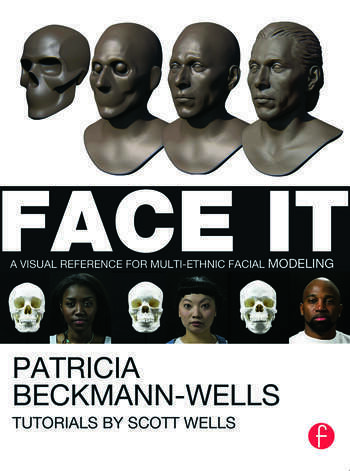 By examining the skulls of people of different ages, ethnicities, and geographical areas, authors Patricia Beckmann-Wells and Scott Wells showcase the intricacies of the human head and face, and show you how to apply that to your models. Whether it be a Caucasion women in her 50s or an African man in his late 20s, you'll know how to properly shape a forehead, an eye socket, and even cheekbones to ensure the 100% accuracy of your 3D character. Educational textbook centred on anatomy as it applies to ethnic diversity in the human race. Book will feature a large collection of reference images on human anatomy and its application to fine and digital arts. Synopsis: Basic comparative morphology of ethnic diversity in skulls as they affect the shape of the human nose and mouth. Synopsis: Basic deconstruction of the human head analysing bone, cartilage, skin and vessel construct. Analyse anomalies and abnormalities that can alter construct, to include such variations as broken noses, birth defects, tumours, and disease. Maturation process of the human head and features. Synopsis: Examine the maturing of the eyes, ears,nose and mouth from youth to old age. Ethnic variations of the male human head and features. Synopsis: Examination of cultural diversity and the human nose and mouth. Examine European Caucasion, Asian Pacific rim, Indian, American Indian, Latin American and African noses. Examine female versus male nose. 3d tutorial - Creating typical male Asian eye. How to use photo reference, measurements, and software. Synopsis: Examination of cultural diversity and the human nose and mouth. Examine European Caucasion, Asian Pacific rim, Indian, American Indian, Latin American and African noses. 3d tutorial - Creating typical female African ear. How to use photo reference, measurements and software. Synopsis: Analyse the basic construction of the human head and features in clay. Example: Measurement of the human nose from classic distance points on the human head. Techniques in clay construction as they pertain to 3d software's and readability. Artist feature - Lead game artist demonstrates clay head construction vs. digital head construction. Synopsis: Personal portfolio work and interviews from leading game and feature film modellers in the clay and 3d applied arts. Dr. Patricia Beckmann Wells, EdD., founder of Bunsella Studios, former head of training and artist development at both Dreamworks SKG and Walt Disney Feature Animation Studios.